This is a Pulitzer Prize-winning book. It spent two years on the NYT Bestseller list. On Goodreads, it averages 4.3 out of 5 stars. And yet, I did not love it. I wanted so badly to love it that I spent more than two weeks reading it, more time than I spent on any one of Ken Follett’s Century Trilogy books, which hover around a thousand pages each. I tried very hard to dig my heels in the story, but in the end, I was glad it ended. I was glad to move on. It isn’t that the story isn’t lovely or moving or beautifully written, because it’s all of those things. In fact, the way in which Anthony Doerr knits together words is one I admire. I’d love to be poetic like he is, but alas, I am not, and perhaps that’s not the sort of writing for me anyway. 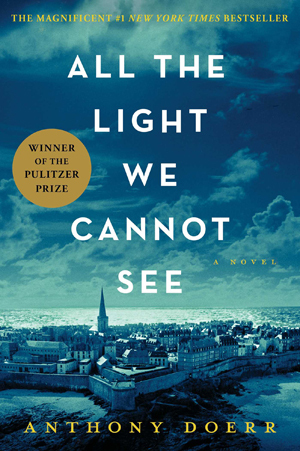 All the Light We Cannot See is a dual-plot story set in occupied France and Germany during World War II. In 1934 Paris we meet young Marie-Laure, the daughter of a museum locksmith. She is going blind by six years old. Her father makes a miniature replica of the city and teaches her to read braille. When Hitler decides to collect a valuable stone from the museum, the curator sends the stone away with the locksmith and he escapes with Marie-Laure to Saint Malo where they hope to keep safe from the Nazis. Meanwhile, a young German orphan named Werner becomes entranced and eventually entrapped in the Hitler Youth. Even at his young age he is a brilliant mechanic and is valued by the regime for his knack for circuitry. He repairs radios and is relied upon for relaying secret messages being swapped across the air waves. The lives of these two young people go on precariously on either side of the Nazi regime. You know their stories will intersect when Marie-Laure and her father settle with an old uncle in Saint-Malo who has a radio transmitter on the top floor of his seaside home. All signs point to Marie-Laure and Werner connecting. Here’s my one spoiler: You will spend many pages waiting for that intersection to occur. The thing the kept me from giving this book four out of five stars on Goodreads is its pacing. The slow build, the chiseling away of each detail, the long steady climb to the climax… it was all so glacial. It is the exact opposite of Marilynn Robinson’s tight narrative. Perhaps I’m an impatient reader. Maybe I just wasn’t in the right frame of mind to walk that long, slow road. Those who enjoy historical fiction might enjoy this book, but those who prefer a quick read might not. Buy All the Light We Cannot See here. I tried twice to listen to this book and stopped with the thought that if I read it, I wouldn’t be so impatient. Sounds like that might not be the case. Thanks for the review! It was really slow, which was a bummer because I was excited to read it.